Junior setter Julia Menosky sets the ball to sophomore outside hitter Jada Jones during a home loss against Indiana University East. The team lost in three sets during the conference play opener and will face Midway University in Midway, Ky. Saturday. The volleyball team knew the error they wanted to fix heading into last week: be competitive the whole match. “We’re trying to get in this mindset of when we face a team, we’re going in, we’re going to win, we’re going to compete and then we’re done,” senior Morgan Dangelo said. The Pioneers listened to Dangelo’s advice last Tuesday to complete two sweeps at a tri-match hosted by Salem International (W. Va.) University. Point Park topped Notre Dame (Ohio) College 25-21, 25-15 and 27-25 before shutting down Salem International in three sets as well. The scores of the sets were 25-10, 25-15 and 25-23. The Pioneers registered 45 kills to the Falcons’ 24. Point Park also racked up 24 errors, 10 more than Notre Dame. Despite the mistakes, the Pioneers finished on top. Senior outside hitter Erica Gumz highlighted the offense with 14 kills followed by seniors Jordan Dixon and Ashley Taylor with 11 and six, respectively. Setter Julia Menosky returned from her two-match hiatus to split the assists with junior Brittney Bianco. Dangelo directed the defense with 19 digs, and Dixon completed her double-double with 14 of her own. As for the latter match, Point Park boasted its season-best attack percentage of .370 with 44 kills and only ten attack errors. Taylor starred in the action at the net with 15 kills, Gumz chipped in ten and sophomore Jazlyn Rozier put down eight from the middle. Menosky directed her hitters with 22 assists, and Bianco added 15. The Pioneers collected ten aces across the board, four of which came from Gumz. The Pioneers hosted Indiana University East (IU East) in their home opener to begin River States Conference (RSC) play last Friday. The Student Center gym filled with friends, family and fellow Pioneer athletes to support the green and gold. The first set proved to be an even match before the Red Wolves gained three points over the Pioneers, ultimately taking the first set 25-19. IU East controlled set two from the start with a 12-3 lead. Point Park fought its way to a six-point deficit but failed to complete the comeback. The Red Wolves took set two 25-17. The Pioneers refused to give up set three without a fight. The set tied in the middle at 14-14 before the Red Wolves broke away to lead 22-17. 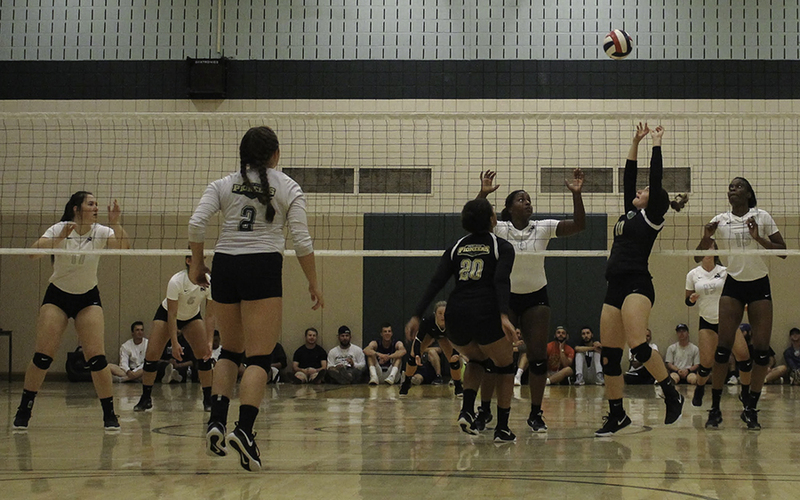 Point Park then earned five consecutive points to tie the match once again. IU East claimed the first set point at 24-22 before Taylor and Rozier collected two key digs to tie the set for a third time. The Pioneers then held the set point at 25-24 and again at 26-25, but the Red Wolves left the gym victorious finishing set three 28-26. Despite Point Park’s efforts, IU East’s defense proved stronger with 68 digs compared to the Pioneers’ 49. The Red Wolves also posted three more blocks than Point Park. Taylor finished the match with a team-high 13 kills, and Dixon, Gumz and Rozier put down five apiece. Menosky dished out 18 assists, and Bianco recorded 11. Dangleo amassed 12 digs from the back row. The Pioneers evened their record to 6-6 overall, 0-1 RSC. Point Park will return to the court on Sept. 25, with a non-conference home match against Washington and Jefferson College.